A long-grain marsh grass, wild rice is native to the northern Great Lakes area. 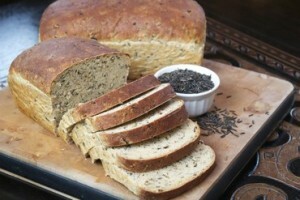 In the following Baker's Collection recipe, the wild rice adds a luxurious, nutty flavor and chewy texture to the bread. This recipe is featured at Thyme In Our Kitchen. Have liquid ingredients at 80°F and all other ingredients at room temperature. Place ingredients in pan in the order specified in your owner’s manual. Select basic cycle and medium/normal crust. Check dough consistency after 5 minutes of kneading. The dough should be in a soft, tacky ball. If it is dry and stiff, add water, ½ to 1 TBSP at a time. If it is too wet and sticky, add 1 TBSP of flour at a time. See our Bread Machine section for more helpful tips and information. Use ingredient amounts listed for medium loaf, combine yeast, 1 cup flour, and other dry ingredients. Combine liquids and heat to 120°-130°F. Hand-Held Mixer Method: Combine rice, dry mixture and liquid ingredients in mixing bowl on low speed. Beat 2 to 3 minutes on medium speed. By hand, stir in enough remaining flour to make a firm dough. Knead on floured surface 5 to 7 minutes or until smooth and elastic. Use additional flour if necessary. Continue with RISING, SHAPING AND BAKING instructions below. Stand Mixer Method: Combine rice, dry mixture and liquid ingredients in mixing bowl with paddle or beaters for 4 minutes on medium speed. Gradually add remaining flour and knead with dough hook(s) 5 to 7 minutes until smooth and elastic. Continue with RISING, SHAPING AND BAKING instructions below. Food Processor Method: Put rice and dry mixture in processing bowl with steel blade. While motor is running, add liquid ingredients. Process until mixed. Continue processing, adding remaining flour until dough forms a ball. Continue with RISING, SHAPING AND BAKING instructions below. Place dough in lightly oiled bowl and turn to grease top. Cover; let rise until dough tests ripe. Turn dough onto lightly floured surface; punch down to remove air bubbles. Roll or pat into a 14x7- inch rectangle. Starting with shorter side, roll up tightly, pressing dough into roll. Pinch edges and taper ends to seal. Place in greased 9x5-inch loaf pan. Cover; let rise until indentation remains after touching. Bake in preheated 375°F oven 30 to 40 minutes. Remove from pan; cool. This loaf is so easy (I used the medium – stand mixer methodd.) I can’t belive how long the loaf stays fresh, without getting stale, or molding. Makes a great sandwich bread with chicken or tuna salad.